As promised when I shared the sweet chili chicken stir fry recipe, here’s the recipe for Instant Pot jasmine rice! 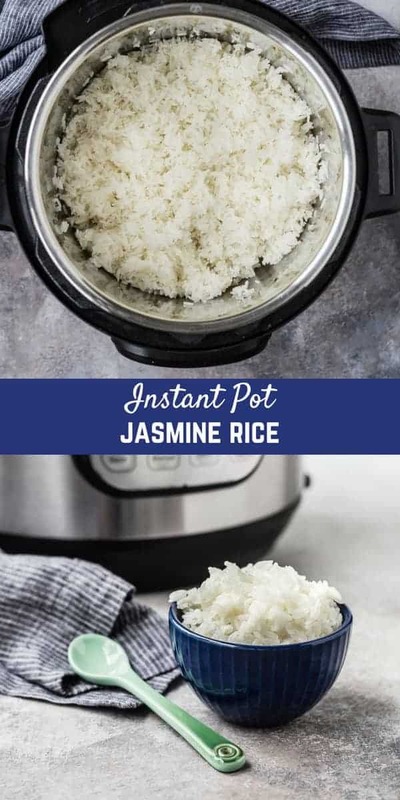 Jasmine rice is one of absolute favorite things, it has the best flavor and it’s perfect with any type of stir fry recipe. Or completely by itself. With butter. There aren’t many things better than buttered rice, am I right? 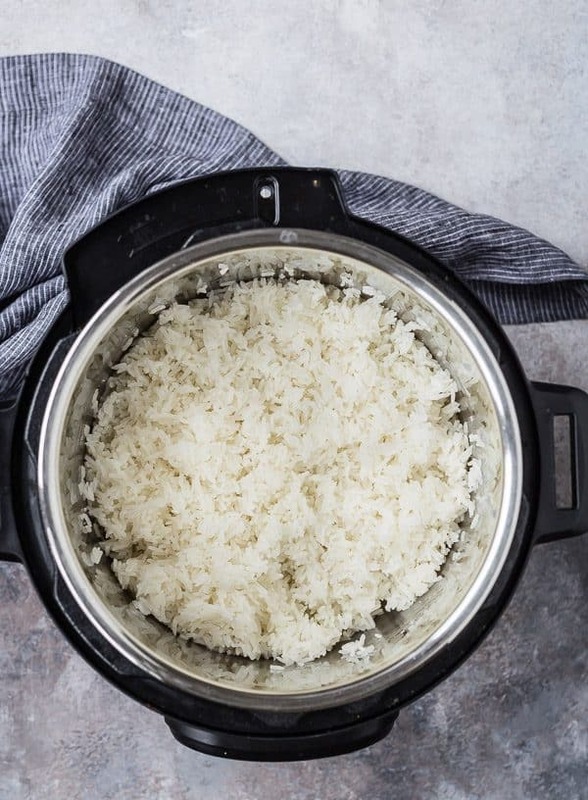 It’s so easy to make jasmine rice in your pressure cooker. As you all probably already know, I have an Instant Pot, but this will work in any type of electric pressure cooker. I made three cups of rice (meaning I used three cups of dry rice), but you could also do this with as little as 1 cup of dry rice. The ratio is one to one (1:1), so it’s very easy to remember! I used water for the liquid, but you could also use broth. I love the flavor of the jasmine rice so I like it to shine through on its own. I did add a little oil to help prevent the rice from sticking together. I chose coconut oil because it complements the flavor of the rice so well, but you could use any type of oil you like, or butter. And don’t forget salt to bring out the flavors of the rice, especially if you’re cooking in water. 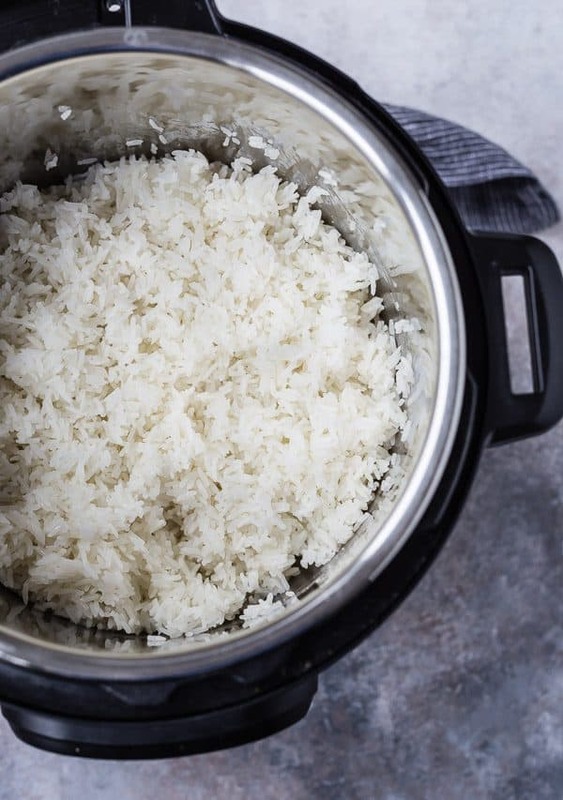 One important step to remember when cooking rice in a pressure cooker is to rinse your rice first. This will keep it from foaming up too much and sputtering out the valve, making a huge mess (any Instant Pot owners know what I’m talking about here?). You’re going to want to make an ultra large batch of this jasmine rice, because it is absolutely irresistible! What is the cook time or how long do you cook Jasmine rice in the pressure cooker? 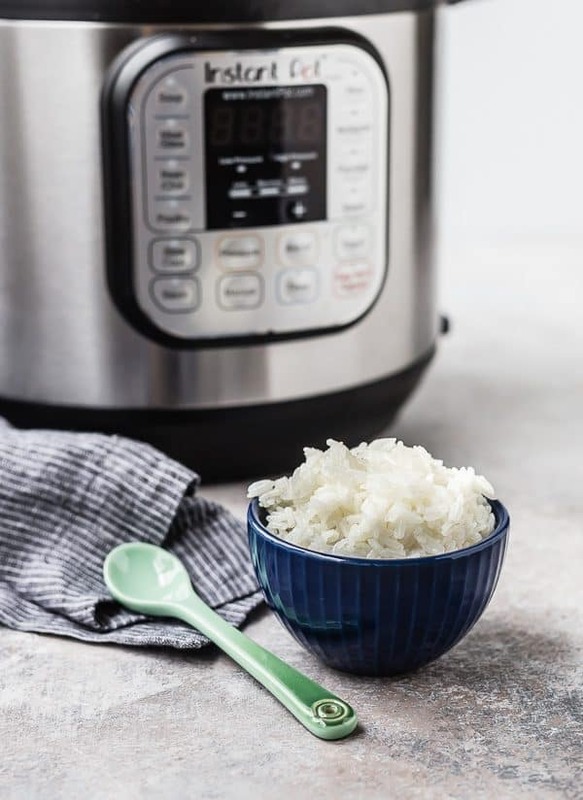 Jasmine rice cooks in a pressure cooker in 5 minutes on high with a 10 minute natural release. 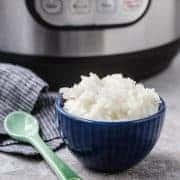 What is the rice to water ratio for cooking rice in the Instant Pot? You want to use a 1:1 ratio of rice to water, so for every 1 cup of rice, you’ll use 1 cup of water (or broth). What setting do I use? I almost always just do a manual setting, but I’m sure your rice setting will work too – just set the time for the amount of time directed in the recipe. Did you know you can also make quinoa in the Instant Pot? 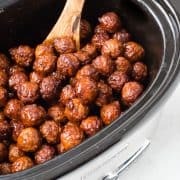 Along with a million other things…make sure to read my complete guide to cooking with an Instant Pot; you’ll find all my Instant Pot recipes there too. Love rice? 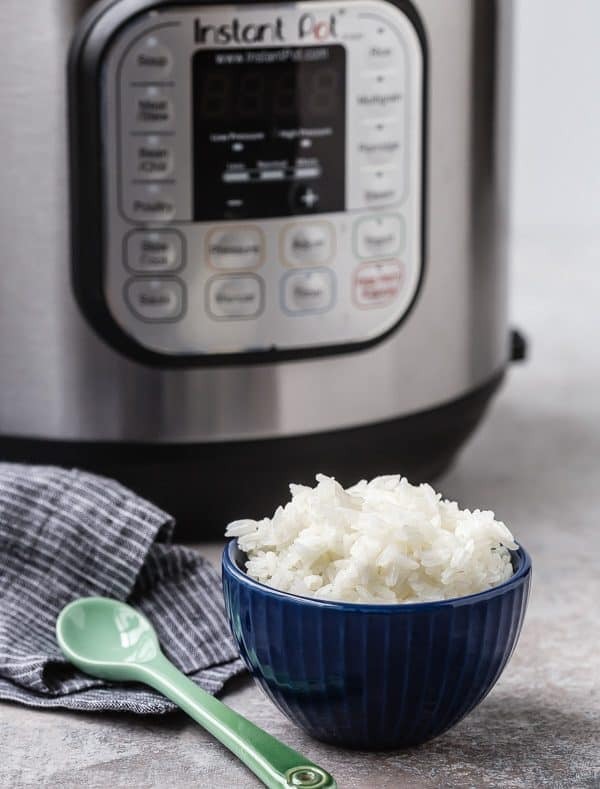 You can also make Instant Pot Brown Rice – the cook time is different than jasmine rice! Secure cover, turn valve to seal, and set Instant Pot on the manual setting for 5 minutes on high pressure. When the timer goes off, let naturally release for 10 minutes (in other words, leave it alone for 10 minutes). Once 10 minutes has elapsed, quick release pressure, fluff with a fork, and serve. Verdict: I kinda want to eat it for breakfast, lunch, and dinner. Seems like a well-balanced diet, right? Husband’s take: Ben loves rice and he has no complaints about jasmine rice, ever. Will 3 cups fit In the 6qt instant pot? 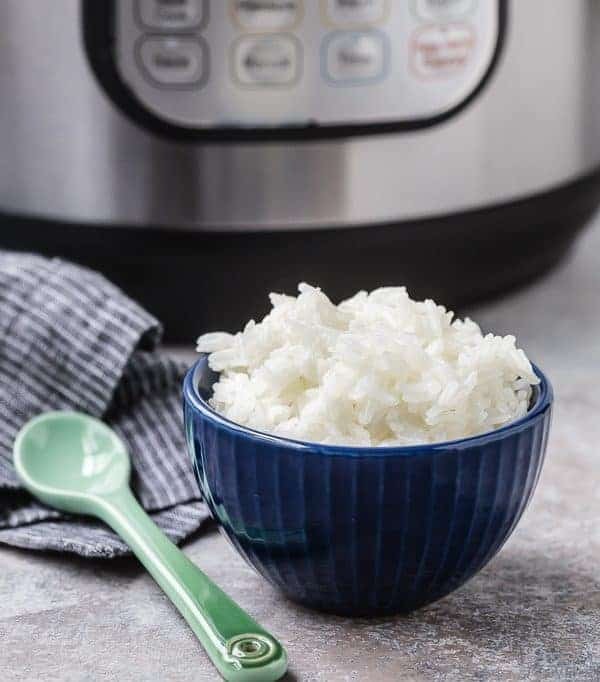 After searching far and wide for info how many minutes to cook rice, I realized my Instant Pot rice setting cannot be changed. That’s because it goes through a rice cooking program, which cooks a little, then pauses, etc, like a sophisticated rice cooker would. Thanks for sharing! Mine has never turned out soggy, so it could definitely be related to the small amount you used. This cook time was not long enough. My rice came out underdone and crunchy. The flavor was good but the rice was too hard. May need a longer cook time in the instant pot. I had to google it, but the altitude where we live is 801 ft – we’re in Michigan. 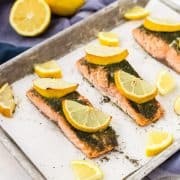 I don’t have any experience cooking at high altitude, so I appreciate your tips and suggestions for Alison and any one else that may live at a higher altitude. That could definitely be a possible cause of the recipe not turning out. Thank you! The yield is off. This only makes about 6 cups cooked rice. Normally rice is cooked with a 2:1 water to rice ratio, which would yield 9 cups. Because it’s cooked in the Instant Pot, less water evaporates, so less water is needed. I hope that helps! Finally! After 12 years of trying to make rice perfectly, this is it!!! I am over-joyed. Thank you so much for this recipe. I could never get it “just right”. Even my picky-eater ate some. YEAH!!! My all time go to! Perfect every time. I love the idea of adding line to it! Making it for my curry right now…YUM! Thanks again for the easy to follow recipe! 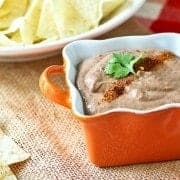 So glad you like this recipe! Thank you so much for taking the time to come back and leave a comment! Unfortunately I got a burn warning. I only did 1.5 cups with butter. Oh no! What a bummer! I’ve never gotten the burn warning…I’m sorry! I wonder if it’s because you did a lesser amount? I’ve never tried cutting the recipe in half. This was the first thing I made in my IP! Thank you, it turned out perfect. I only needed about 2 cups cooked rice so I used 1 cup uncooked rice. So yummy. Will make this again. Great tup about the coconut oil. I used this for a thai peanut chicken dish and the coconut was great. I also ate some rice alone and sprinkled lime juice on it and just the rice with coconut and lime flavors was SO GOOD as well. So glad to hear you liked the rice! I’m so happy you tried it with coconut oil! And good call on the lime! Thanks for taking the time to come back and and leave a comment! why do you add oil to the rice & water?